We’ve mentioned before that the children’s chapter book we have been blogging, “Jake, Little Jimmy and Big Louie” is also being sent to two of our great-grandchildren for their comments as to the appropriateness of the writing for children ages 7-12 and also to perhaps receive some pictures they’d like to draw for the book. Just today we received some real affirmation that we are on the right track. 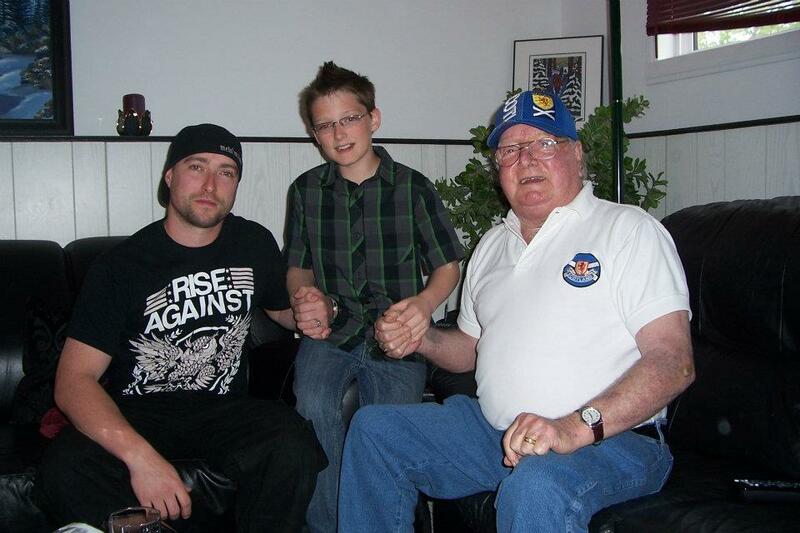 Here is the message received from our 12-year-0ld great-grandson Leland along with a photo of Leland with his dad Calan and great-grandpa Ian taken last summer in Winnipeg. “Hey grandma and grandpa i just finished reading the first six chapters of that book you sent me and it was one of the best books I’ve ever read!!!!!!!!!!!!!!!!!!!!!!!!!!!!!!!!!!!!!!!!!!!!!!!!!!!!!! ‘and im also starting to draw the picture for the second chapter, but i just started it because i was reading for about an hour so my eyes are really stressed out right now so im going to go to bed and i will continue tomorrow! Thanks to Leland. We don’t think we’ve ever had such a great review! Watch for the next chapter to be blogged tomorrow. This entry was posted in Blogging, Blogging a book, Canadian theme, Children's chapter book, Review and tagged becoming a writer, birds, boy wanting a pet, children, family, raising birds. Bookmark the permalink. but instead oof that, this is fantastic blog. Agreat read. We’d recommend joining WordPress to start your own blog and also check out a wealth of other blogs for information and inspiration. Thanks for your kind words. Hope you visit again. It was good to hear from you. thanks for your feedback. Visit again.